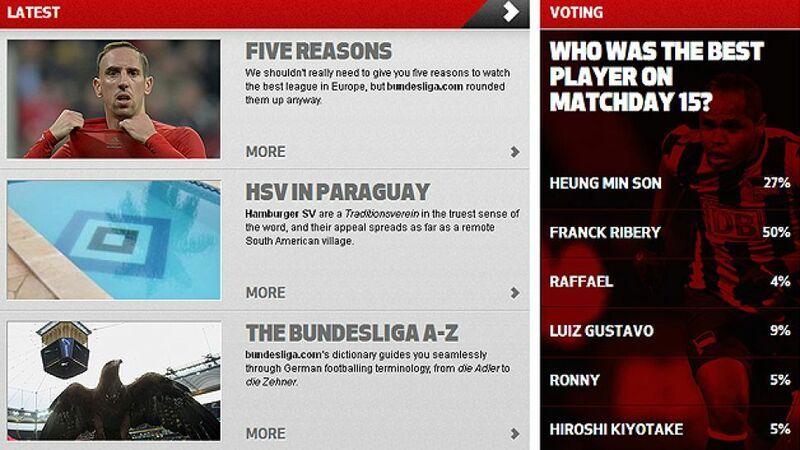 Munich - FC Bayern München winger emerged as the clear winner of bundesliga.com's Player of Matchday 15 vote. Exactly half of the site's users that voted were enchanted by yet another stunning display from the Frenchman, which ended with two goals, two assists and a 7-0 win for Bayern away at SV Werder Bremen. The Frenchman was indeed Bremen's scourge in the Weserstadion. After the hosts had competed well in the opening quarter of the match, Ribery put the Reds on the road to victory when his teasing cross was put through his own net by Assani Lukimya. Countless successful dribbles later and Bayern were celebrating their biggest win since new coach Pep Guardiola took charge, while Werder were licking the wounds of their heaviest ever home defeat in the Bundesliga. It continued a remarkable season for Ribery personally, after he was elected 2012/13 UEFA Best Player in Europe and made the three-man shortlist for the 2013 FIFA Ballon d'Or Award. Coming in second place in the poll, but still a long way off the winner, was South Korean international Heung Min Son, who once again proved his worth to Bayer 04 Leverkusen by netting the winner in their second versus third clash away at Borussia Dortmund, garnering him 27 per cent of the vote. Son's clinical first-half strike was, remarkably, his fifth goal in his last three league appearances against BVB and ensured that Leverkusen consolidated their position as Bayern's closest challengers by keeping the gap on the league leaders at just four points, as well as opening up a seven-point advantage over die Schwarzgelben. VfL Wolfsburg midfielder Luiz Gustavo isn't normally known for his assisting, but his pass for Ivica Olic's goal in the 3-0 win at SC Freiburg, as well as an assured overall display, gained him nine per cent of the vote and third place. Then came Hertha Berlin's Ronny, who provided two assists himself in the 2-0 success at Eintracht Braunschweig, and 1. FC Nürnberg's Hiroshi Kiyotake, who created der Club's goal in the 1-1 draw with 1. FSV Mainz 05. Both players took five per cent of the vote. Borussia Mönchengladbach forward, and brother of Ronny, Raffael, brought up the rear with four per cent after his curling strike helped see off FC Schalke 04.